balsa and tissue flyer This purely-for-fun project was Adam Agee's 27th birthday present to himself. The removable wings are friction-mounted on spars that allow them to be rotated by hand about their axis, thus determining the flight path. 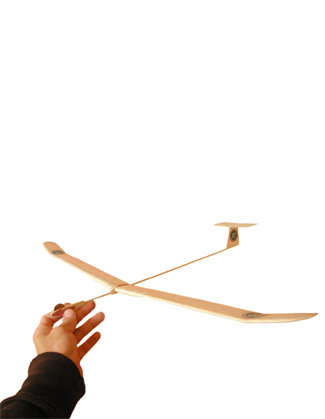 The nose of the glider is weighted by a penny fit into a slot. The control-wing design is a concept dating back to 1895 by Dr. George A. Spratt and his son, who built a number of gliders, flying boats, and even a flying car!